The No. 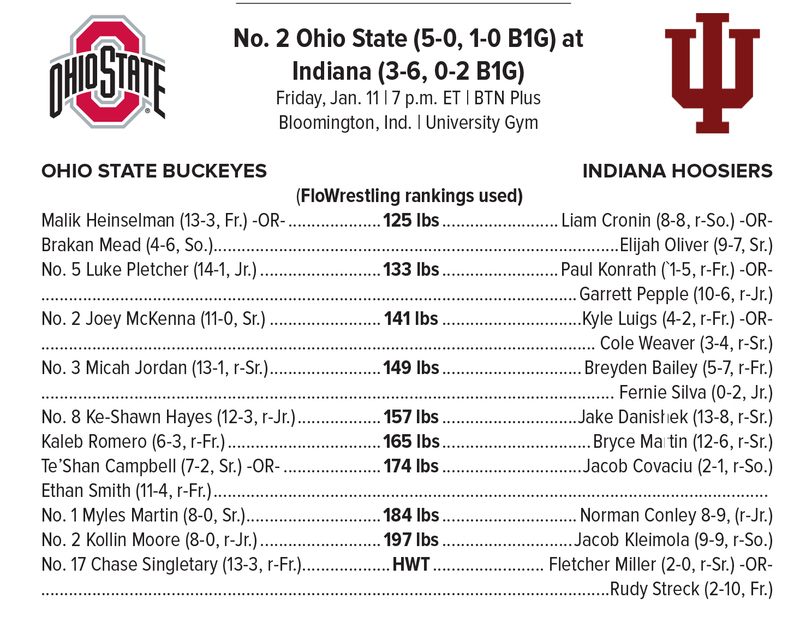 2 Ohio State University wrestling team will split its time between Bloomington, Ind., and St. John Arena this weekend with a road dual at Indiana on Friday (Jan. 11) at 7 p.m. ET before hosting Michigan State Sunday (Jan. 13) afternoon at 2 p.m. ET. Both B1G duals to be streamed on BTN Plus. Ohio State owns a 49-34-2 edge in the all-time series, including the last nine in a row. The Buckeyes have won 17 of 19 clashes since 1997. Friday night will be a farewell of sorts as the Hoosiers open a new venue, Wilkinson Hall, two days later versus Maryland. Indiana is hosting Friday’s dual inside University Gym. Sunday marks the 70th all-time meeting between the Buckeyes and Michigan State. The Spartans own a 40-29-1 advantage all-time, but it is a series dominated by the Scarlet & Gray since the turn of the century. Ohio State has won 13 of 14 tussles since 2000, including the nine most recent. The last time MSU walked out of St. John Arena as a victor was 1997. Ohio State opened up 2019 by topping fourth-ranked North Carolina State, 26-10. 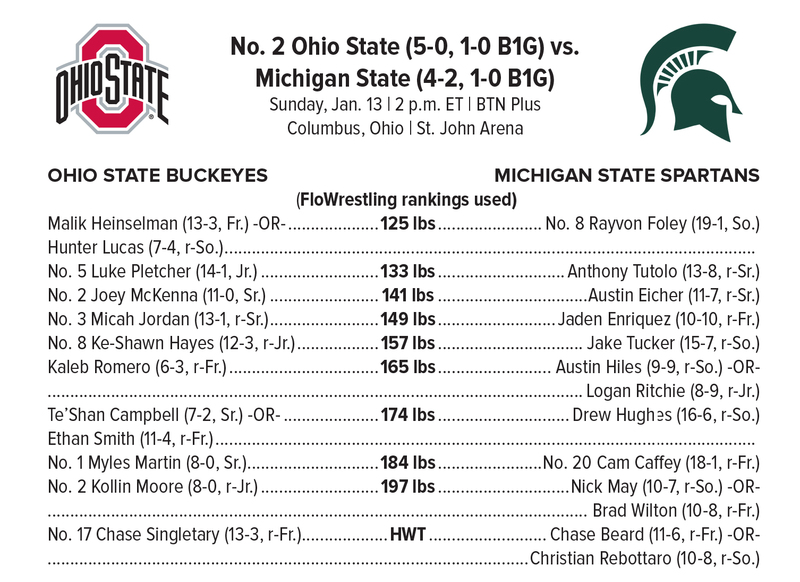 The Buckeyes took 7-of-10 bouts to improve their season dual record to 5-0. Micah Jordan and Myles Martin both earned victories over top-5 foes. Jordan nailed the go-ahead takedown against No. 4 Justin Oliver with just six seconds left in the match while Martin rolled to a 12-5 decision over No. 3 Nick Reenan. Both nationally-ranked NC State grapplers were previously unbeaten in 2018-19. A last-second escape by Nick Reenan last week spoiled Myles Martin’s major decision bid. It was just the second time this season Martin has failed to notch bonus points and only the ninth decision out of 39 wins over the past two seasons combined. The Buckeye senior has secured bonus points in 30 bouts as an upperclassman with 13 tech falls, 11 major decisions and six pins since the start of the ‘17-18 campaign. Myles Martin (8-0), Joey McKenna (11-0) and Kollin Moore (8-0) all enter the weekend with flawless season records. The trio is ranked No. 1, No. 2 and No. 2, respectively, in their individual weight classes. Luke Pletcher has registered bonus points in eight of 14 wins this season with three major decisions, three pins and a pair of tech falls. He’s made extra team tallies a point of emphasis after posting just four bonus point efforts in 30 wins last season.